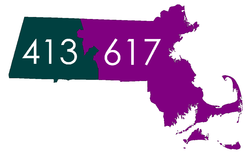 Area codes 508 and 774 are North American Numbering Plan (NANP) telephone area codes for the U.S. state of Massachusetts. 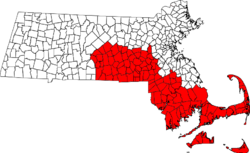 This service area currently includes south-central and most of southeastern Massachusetts (LATA code 128). It includes Worcester, Outer south & southwest Greater Boston (such as the MetroWest region), as well as Fall River, New Bedford, Cape Cod, Martha's Vineyard, and Nantucket. 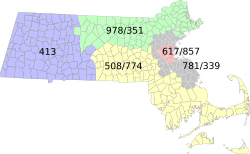 Area code 508 was created on July 16, 1988, as a split from area code 617. Prior to this split, 617 served the entire eastern two-thirds of Massachusetts from roughly the western end of Worcester County to Boston, The Cape and Islands, & The South Coast, while area code 413 (then as now) served all points west of the original 617 boundary. Permissive dialing of 617 and 508 continued until January 1, 1989. On September 1, 1997, area code 508 was split, with area code 978 being assigned to the northern part of that service area. Area code 774 is an overlay area code that was added to share the 508 service area, beginning on May 2, 2001 and continuing to the present day. Since then, 10 digit local dialing is mandatory. Some mobile phone numbers from the 1990s assigned to communities in the former northern half on 508 (now the 978 area code) kept the 508 area code just on those mobile lines after it split. As of 2018, the 508/774 NPA is projected to be exhausted by 2045. This article related to a telephone area code is a stub. You can help Wikipedia by expanding it. This page was last edited on 10 April 2019, at 02:34 (UTC).